A spiral staircase fire escape was required for the three-storey building, where open plan living / dining / kitchen space on the ground floor leads onto a deck through a wall of glazed doors. A curved wall rises up through all three floors. Voids, double height spaces and internal vistas ensure that the four bedroom house feels spacious, whilst numerous balconies and terraces open it to the harbour views. 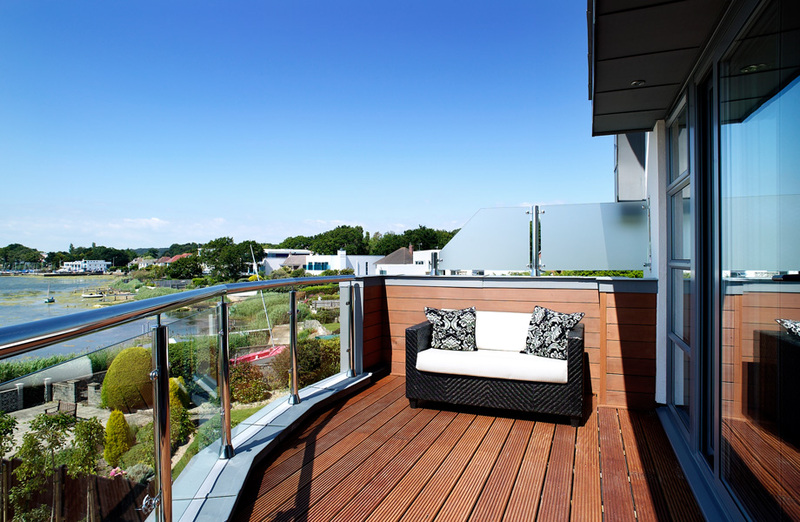 For Dawn and John Cousins building their new home in Poole was all about the view. The couple endured five years of living in a sub-standard 1930s house, ripe for demolition. They caught rainwater in buckets positioned under the leaking windows and dreamed of a brand new house which would make the most of their enviable site overlooking Poole Harbour, Brownsea Island and the Sandbanks peninsula. "I was an estate agent, and first met John when I sold him a house twelve years ago," says Dawn. "My last home was a period property, furnished with antiques, but John and I both wanted to live by the water. 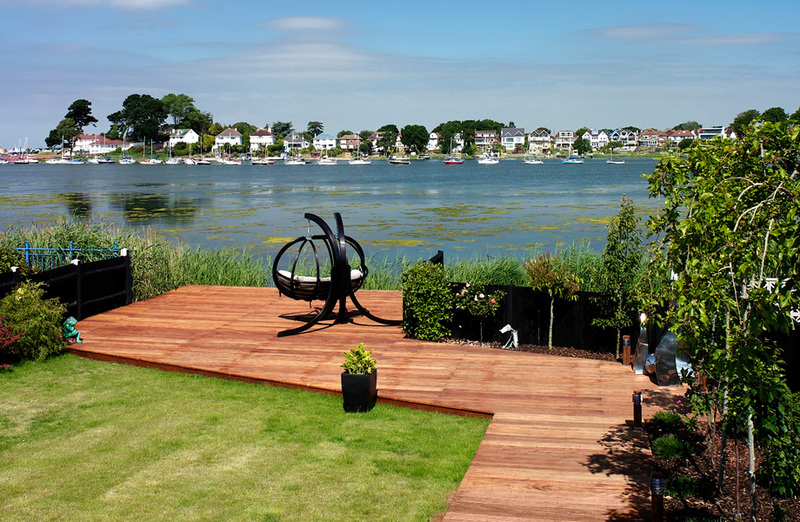 When we found this house beside the harbour we moved fast to exchange and complete the sale within seven days." The Cousins tolerated life in their damp, draughty house, hoping that they would one day be able to replace it with something altogether more contemporary. "There was no point spending any money on the old place - it was past renovation and was suffering from subsidence," says Dawn. "We were tired of living with clutter and our plan was to build something ultra-modern." John and Dawn contacted local architect, David Wright, who took them to visit some of his contemporary residential projects in the area. One house in particular captured their imaginations. Steve and Sally Gorvin's luxurious, three-storey waterfront home on Poole harbour was built almost entirely by members of the family. 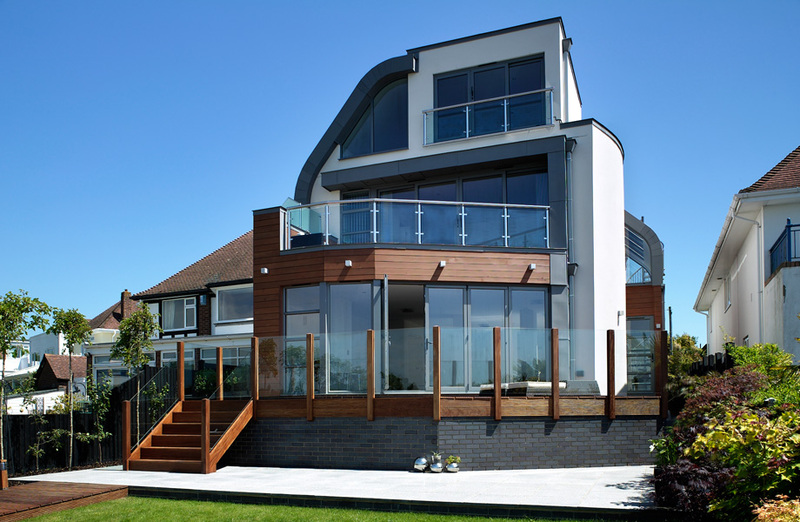 The award-winning house is a fabulous combination of glass and steel, designed around the views and incorporating a number of nautical-style touches and high-tech gadgets. "I fell in love with that house," says Dawn, "and although I knew our long, narrow plot couldn't accommodate such a large building I asked David Wright to design a scaled-down version, which was approved by the planners." The intent was that every room should enjoy a view of the water, which dictated a relatively open plan layout at entrance level, with a glass atrium dropping light into the heart of the building. "One of Dawn and John's requests was that, upon entering the front door, it should be possible to see right through the house to the view," explains David. 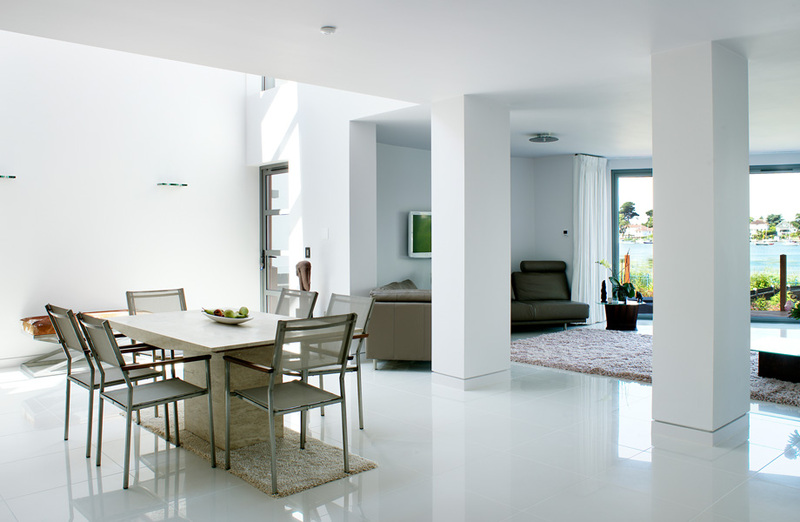 "They wanted an open plan layout downstairs, but felt that the kitchen should be well defined and distinct from the living and dining areas - and the structural columns do help to break up this large space." Three years passed, and the couple were still no closer to realising their dream. A generous offer for their plot finally galvanised them into action, however, as they appreciated that a decision needed to be made. Either they were going to build on the land or they would sell up and enable someone else to develop the site. "We knew that if we left we would probably never come back to the water," says Dawn. "It was a chance in a lifetime, so we decided to go for it before the planning permission expired." 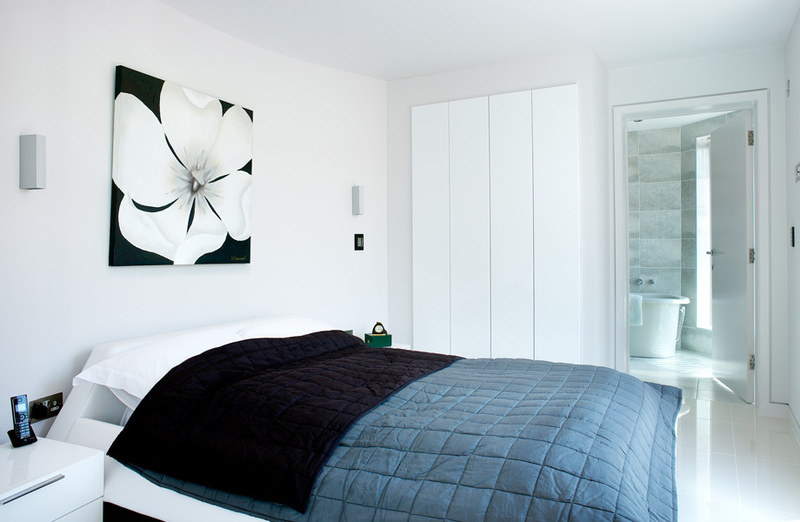 As former arts director of Vogue, John had worked in London and had previously built his own home. His deteriorating health meant that Dawn needed to manage the Dorset build alone, however, constantly juggling site and hospital visits. Fortunately, her chosen builder proved to be worth his weight in gold. "I originally asked Steve Gorvin if he would take on the roofing contract, but in the end he worked twelve hour days and project managed the entire build," she explains. "The quality of workmanship in his own house convinced me that he would be perfect for the job, and it was the best decision I could have made because he was fantastic - conscientious and a real perfectionist. He couldn't have taken more trouble if he'd been building the house for himself. I relied on him totally." Steve, a former roofing contractor, now works with his sons building high-spec contemporary homes. "This was the first time I'd worked for a specific client, rather than building a development to sell," he explains. "I was slightly concerned about how we would get on, but Dawn and I never had a cross word and everything went incredibly smoothly." The Cousins purchased a house nearby, where they lived during the fourteen month build. Watching the demolition of the old 1930s property proved to be a real high point, as the site was finally cleared to make way for their sculptural new home. The unusual stepped shape of the three-storey house means that many of the walls do not align - requiring load-bearing steelwork to carry them and to support the numerous terraces and balconies. Expensive piled foundations needed to be driven eighteen metres into the ground by a specialist subcontractor, with reinforced foundations constructed by the same company. The building has also been substantially raised as a precaution against flooding due to global warming, which has improved views from the ground floor rooms. "I worked with one of my sons on the groundworks, putting in the drainage and so on," says Steve Gorvin. "We employed a bricklaying gang to build the blockwork cavity wall structure, which is finished externally in a self-coloured render. It wasn't a straightforward build but I definitely enjoyed the challenge." Steve worked alongside the members of his team, building floors, erecting stud walls and tackling the carpentry for the unusual roof, which required curved structural beams supplied by a steel fabricator. Once Steve had decked, insulated and waterproofed the main roof this was clad in zinc by a specialist contractor. 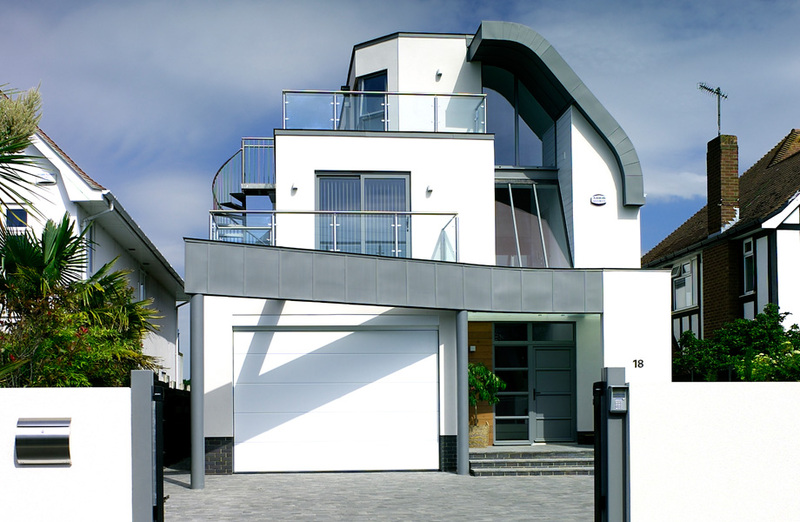 Other elements have also been finished in zinc, including a prow-like beam to the front of the house which projects out from the glass-roofed entrance porch and is supported on slim metal posts. "There is glass absolutely everywhere," says Dawn. 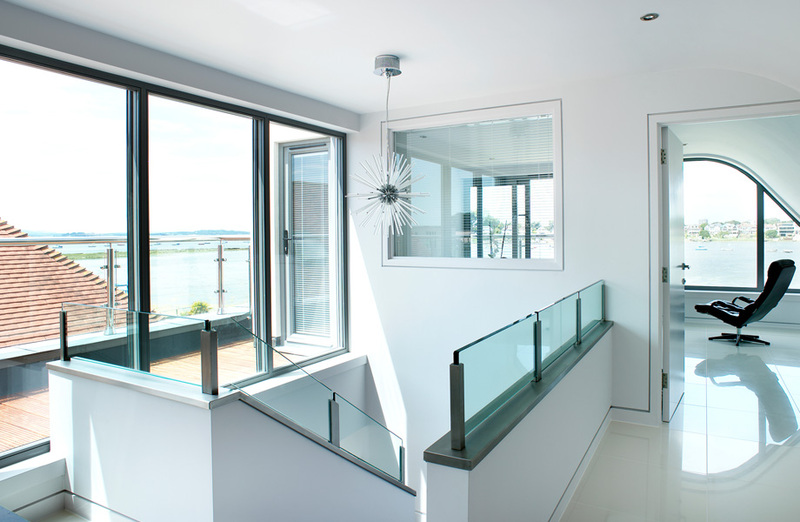 "As well as the folding doors, the windows and roof glazing we also have glazed balustrades. It means that the house is always light and feels just like a holiday home. Virtually every room has a view of the water and the sunsets are incredible from here." Dawn had renovated several properties in the past but admits that she had her doubts about building a brand new house. "John only managed to visit the site twice throughout the whole build, as he was in and out of hospital during that time," she explains. "Steve stepped in and was a huge support." Disenchanted with bland cream and Magnolia interiors, Dawn took the decision to paint the walls a very pale shade of grey. "Even the decorators thought I was mad, but they later admitted that the colour works," she says. 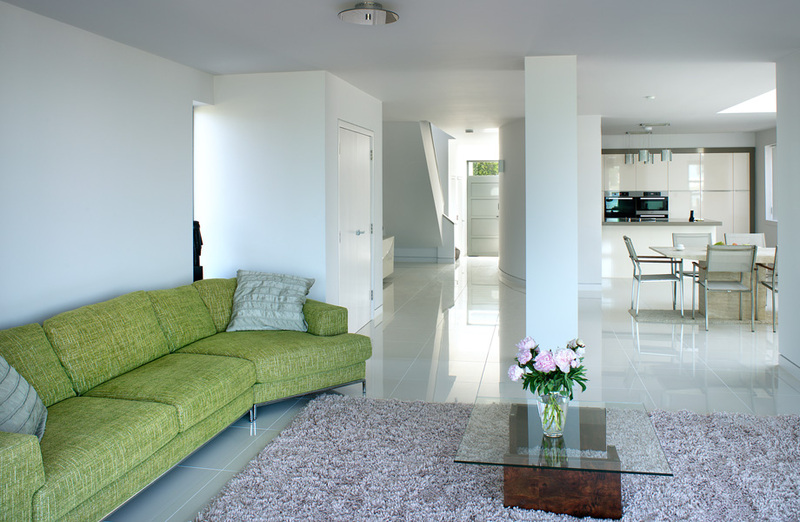 Pearl white tiles were laid over underfloor heating on the ground floor, with carpet for stairs and landings, and Dawn worked hard to shop around and stay within her budget. The cream gloss kitchen is her one regret ("I should have stuck to my guns and had white - plus they were the only company we fell out with") but gadgets such as the retractable extractor and the fold-down tap make her smile and ensure that the kitchen area blends with the rest of the open plan living space. A programmable lighting system has been installed and the house is wired for electric blinds and other gadgets which can be added in the future. "David Wright's design is perfect, and there are wow factors all over the place. We've only been here three weeks but we couldn't be happier," Dawn concludes. "When John first moved into the new house and I saw the look on his face I knew that it had all been worthwhile. He's glued to his binoculars and is constantly admiring the view now it has been opened up to us. If you have such an amazing plot you need to put something worthy on it, and thanks to our architect and builder I think we've done it justice."